You are here: Home / A-Blog / MEDIA BUZZ: Florence still at sea and already Trump is being hit for response. 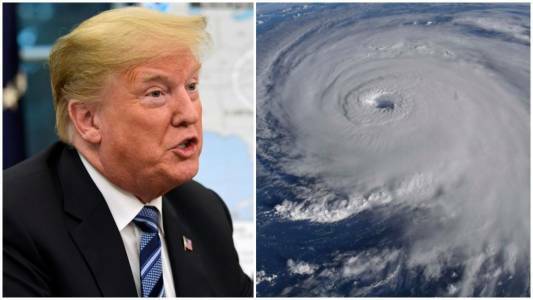 MEDIA BUZZ: Florence still at sea and already Trump is being hit for response. As the media blast out dire warnings about the destructive power of Hurricane Florence, they are also beginning a familiar ritual involving President Trump. That is, the charge that he’s not very good at handling these things. The storm hasn’t even made landfall, and once again we’re hearing that Trump is lousy at emergency management and that he’s tone deaf when it comes to providing aid and comfort. But then came Puerto Rico, which was absolutely devastated by a hurricane that so thoroughly destroyed the power grid that electricity wasn’t fully restored until recently. Trump was lambasted for tossing paper towels into a crowd there. And while it’s a fair criticism that the administration didn’t focus as much attention on the Puerto Rican disaster, neither did the media—until they turned it into a Trump-is-screwing-up. CNN’s Jeff Toobin even turned it into a racism argument: “They’re not white people, and they don’t count to Donald Trump as much as the deaths of white people.” So why did the deaths of Puerto Ricans—who are of course Americans—get a small fraction of the coverage as those in Florida and Texas? And by the way, any administration would have struggled with the wreckage on the poverty-stricken territory. What triggered the latest round of criticism was a FEMA briefing on Florence at which Trump boasted about that situation. “I think Puerto Rico was an incredible unsung success,” said the president, who also tweeted that his administration did an “unappreciated great job” on the island. Well, it didn’t take long for journalists to point out that nearly 3,000 people died from that storm, a tragic figure that was only recently officially confirmed after the ludicrous early estimate of less than 100. And the president kind of stepped in it by not pointing that out. And The Washington Post highlighted a Democratic senator’s charge that the Trump administration transferred $10 million from FEMA to the immigration agency’s detention program—a sensitive matter with Florence about the strike the Carolinas. That is fair game for debate, but the Politico piece raised the broader question of the president’s demeanor by citing his Sept. 11 visit to Shanksville, Pa., where a plane hijacked by terrorists was forced down 17 years ago. Trump actually delivered a beautifully written speech at Shanksville. But those two seconds came to define the day because it fit the narrative. Look, this is a career businessman, and he doesn’t have the hand-holding instincts of polished politicians. And if the White House does a lousy job with Florence, journalists should aggressively report that. It’s just telling that the media are awash with these stories before the storm even makes landfall. Howard Kurtz is a Fox News analyst and the host of “MediaBuzz” (Sundays 11 a.m.). He is the author “Media Madness: Donald Trump, The Press and the War Over the Truth.” Follow him at @HowardKurtz. Click here for more information on Howard Kurtz.